What is your definition of a special day? So special that you would make your lunch the night before, get up early (even on a weekend! ), fill a thermos with tea or coffee, and ignore such temptations as lying in to read the weekend papers in bed. 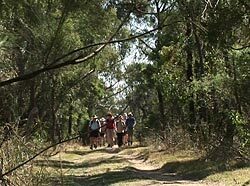 For many, the anticipation of a day spent bushwalking will get them jumping out of bed. 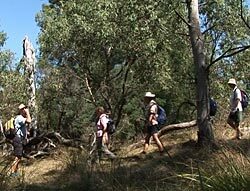 Call it bushwalking, hiking, rambling or tramping, walking in nature is the ultimate balm for fast city living. Get up and get out there as soon as you can! Bushwalking is the ultimate pleasure sport  a fitness activity, an immersion in the beauty of nature and, more often than not, an adventure into the unknown. Whilst most bushwalkers walk on established tracks, there is often an element to the walk that is a surprise  a plant or flower that you have never seen before, a new birdcall, or the sunlight illuminating the leaves overhead. Of course, in some countries, that surprise could be less than comforting. You may run into a grizzly bear in a Canadian forest or a red-bellied black snake in the Australian bush. In all cases, the scout motto will hold you in good stead. Be prepared! If you are prepared you will survive, enjoy and, best of all, have a story left to tell at the end. A good days bushwalking is the result of your preparation. You need food and water, sun, rain, and cold weather protection, a first aid kit, a map, a compass and the good sense to tell someone where you are going and when you are likely to come back. It also helps to inform yourself about the dangers of the local area. For beginner walkers, it is wise to stick to set tracks and begin with a half-day walk to check out your fitness levels and see how your muscles feel the next morning. You will probably find that you are fitter than you think and able to walk five or six kilometres without much trouble. 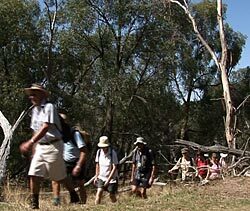 Bushwalking can also be the perfect sport for those with limited mobility as many national parks and recreation areas have built short tracks for people using wheelchairs, walking frames or walking sticks. These will often be sited around areas where there is the maximum opportunity to view the flora and fauna specific to the area. Walk options range from a day walk up to hundreds of kilometres, as bushwalking combines well with camping, canyoning, abseiling, and even skiing if you are happy to do your bushwalking through the snow. Bushwalking can be transformative. Clean out the cobwebs of your mind and give your whole body a work-out by waking up to the possibilities of stretching, striding, climbing, jumping and relaxing in the silent beauty of a natural landscape. Feelings of anger, bitterness and hatred are negative. If I keep them inside me they would spoil my body and my health. They are of no use.